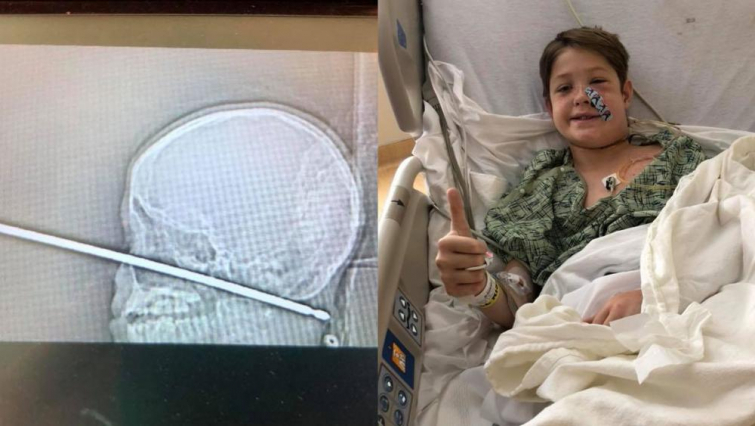 The parents of a 10-year-old boy are thanking God after their son miraculously survived falling face-first on to a meat skewer. Xavier Cunningham had been playing in his treehouse in Harrisonville, Missouri, Saturday when a swarm of yellowjackets began to attack him and his friends. He fell onto a foot-long rotisserie skewer. The skewer went through his face. It reached the back of his head. After rushing Xavier to the hospital, Xavier and his parents learned the skewer missed key parts of his brain. "It missed his brain. It missed his brain stem. It missed the nerves, everything that is valuable in your head. It missed everything," his father Shannon said. Koji Ebersole, director of Endovascular Neurosurgery at The University of Kansas Health System, said removing the skewer was a high-risk procedure. "This thing had spared the eye, spared the brain, spared the spinal cord. But the major concern was the blood vessels in the neck." "I have not seen anything passed to that depth in a situation that was survivable, let alone one where we think the recovery will be near complete if not complete," he told the Star. Shannon said his family turned to prayer. "I said, 'Lord, I don`t care. I know You have a plan.' The surgery lasted several hours but was successful. "It was a miracle," father Shannones concludes. "Only God could have directed things to happen in a way that would save him like this."